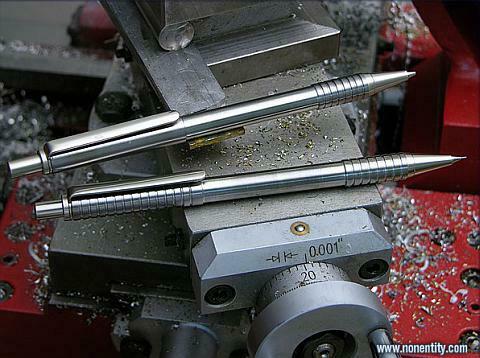 Here is a short pictorial about how this machinist/craftsman makes high quality artist pens and pencils out of stainless steel rods salvaged from a copier. He charges 100 bucks a pop. Pretty steep. I make pens and pencils as well, and give them away. Kits for the internals can be had from eBay for about 2 bucks each for the slimlines, and 3-4 bucks for the fancier ones. The wood blanks can be had for dirt cheap for domestic hardwoods; less than a buck. Of course, exotic hardwoods, acrylics and other materials are more expensive, sometimes running $12 apiece or more. I thing the most expensive pen I made was out of a corncob blank (which run $10 each), and that probably cost me a whopping 15 dollars all told.